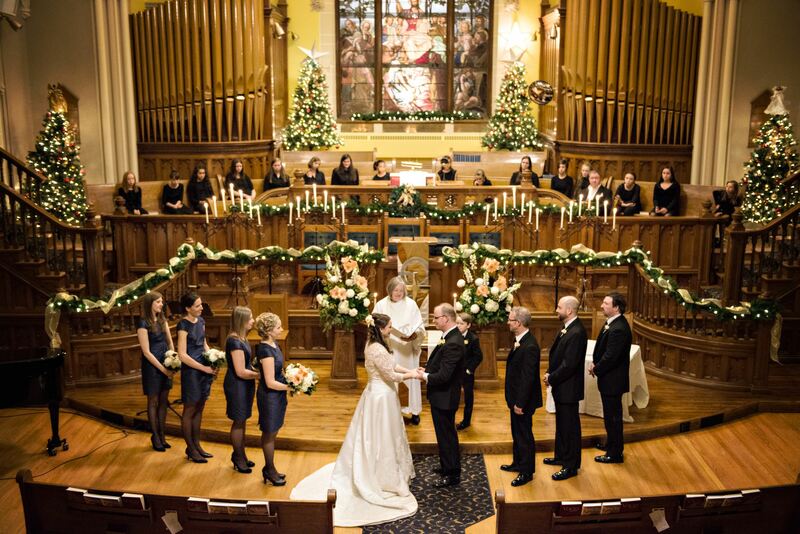 The ministers and congregation of Trinity United Church, Cobourg would like to invite you to have your wedding in our beautiful, 19th century sanctuary. You do not have to be members of the church in order to be married here, but we do encourage you to find a faith community to call home. You will find that becoming active in the worship and educational life of the church will be a means of enrichment for your married life and for your future family. All couples who request marriage at Trinity United Church will be treated equally regardless of gender identity or sexual orientation. A church wedding is a service of Christian worship. In it two people who love each other are married in the presence of God and God's people, and a blessing is pronounced upon them. It is fitting that this service take place in the church sanctuary. Your church wedding will have the reverence, joy, beauty and simplicity of sincere worship. If you would like your wedding to be held in a location other than the church, please make your request known to the minister early in your contact with the church. Please book the church/minister as far in advance as possible. When you first contact the church office you will be asked to contact the minister to confirm that your wedding will be held at Trinity United Church, or other location, and to set the date and time. Only Trinity United Church clergy preside at weddings held on the premises. Other clergy, family members or friends may assist in the service if the officiating clergyperson agrees. It is required by the Province of Ontario to secure a marriage license (see exception below), by making application at any municipal government office in Ontario. The office in Cobourg is at 55 King St. W. (Victoria Hall). To find out what you need to bring with you when making application for a license, you should call the office (905) 372-4301 before going in. The license is good for 90 days. Please bring the license to the church office at least one week prior to the date of the wedding. Couples who attend worship regularly may use marriage banns instead of a license. If the couple is attending different churches, banns must be published in both churches during services of public worship. This needs to happen three weeks before the date of the wedding. A Record of Marriage (originally part of the marriage license) will be given to you following the wedding ceremony. Although purchased from the Province of Ontario as part of a legal document, this Record of Marriage does not meet all legal requirements to prove your married status either in Ontario, other parts of Canada or other countries. Please read the instructions that come with your Marriage License. It is possible to obtain a copy of the complete and signed Marriage License (which is returned to the Province of Ontario following the wedding), including the Seal of the Province, which will serve as legal proof. The Minister of Music for Trinity United Church is available to play at church weddings and it is understood that she will always officiate where music is required unless other arrangements, meeting with the approval of the Minister of Music and the officiating minister, have been requested during one of the initial meetings with the minister. You will be given a "Wedding Music Folder" prepared by the Minister of Music. You are asked to contact her within two weeks of the date you receive confirmation that your wedding will be held at Trinity United Church. She will discuss with you the specific music for your wedding service. We ask you to keep in mind that many popular "love songs" are not suitable during the worship service. Often these numbers are more fitting as a part of the entertainment at the reception which follows the religious service. We cannot permit recorded music to be used for a wedding service, nor can copies of music or words be used where copyrights are involved. Click here for more wedding music information. The general guideline to follow when planning photography (still or video) is that we are participating in a service of worship and anything that takes place must be done within that context. Photographs of you entering and leaving the sanctuary, as well as signing the marriage register are fine. However, we ask that no photography take place during the wedding ceremony itself in order to preserve the reverence of the occasion. It is possible for one designated photographer (usually a professional) to take available light photographs from the balcony area. This is also true for one videographer from a set position. Following the recessional you may wish to return to the sanctuary to pose for photographs. Ask your photogarpher/videographer to speak to the minister prior to the service. We cannot guarantee that "last minute" requests will be accommodated. The above guidelines also apply if you wish to make an audio recording of the wedding service. If you wish to place floral or other decorations in the sanctuary please tell the minister. Remember there may be more than one wedding on a particular day, therefore it is not always possible to place decorations hours before your service, however this may mean that you can share flowers, etc. with another couple being married that day. The use of confetti, rice, bird seed, etc. is not permitted within the church building or on the church property. These materials cause damage or risk. Please advise your guests. The rehearsal is usually held the evening before the wedding day, however another time can be arranged if necessary. All members of the wedding party should be present. Please be on time or early for both the rehearsal and the wedding, especially since we may have more than one rehearsal or wedding on the same day. If you wish to invite the minister or others members of the church staff, please include them on your invitation list so that they can respond as would any other guest. The following fee schedule has been established by the council of Trinity United Church. It is emphasized that these fees are subject to review and that the actual fees for your wedding will be according to the schedule in effect on the date of the wedding. Contributing members of Trinity United Church or their daughters or sons do not pay the church rental fee. It is assumed that they are, through their offerings, already paying their share of church building costs. Before a wedding booking is confirmed, a deposit of $100 (cash or cheque payable to Trinity United Church) must be paid. This amount is then deducted from the church rental fee shown above, leaving a balance of $150 to be paid for this part of the fee schedule. This deposit is not required from church members. No refund of the deposit is made except at the discretion of the minister. Other than the deposit, the fees are to be paid in cash at the rehearsal or earlier and given to the presiding minister, marked with the staff person's name or position, in separate envelopes. Due to economic hardship, the church rental fee may be waived. In this case, we ask that a contribution equal to 10% of the total cost of the wedding (including the reception) be paid to Trinity United Church. If you wish to have candles used during your wedding service you are responsible to supply them (please check with the minister as to the number required). For weddings conducted at a location other than the church building, only those on staff who participate are to be paid their fees plus, in some cases, travel expenses. The church sanctuary can seat approximately 650 people comfortably. For your comfort and safety, Trinity United Church is a designated smoke-free building, as is the church property. The congregation of Trinity United Church welcomes you not only on your wedding day, but also in the days and years that are ahead. We do not require that you attend or be members of this congregation to be married here. However, we do encourage you to attend worship (Sundays, 10:30 am) both before and after your wedding so that you can become better acquainted with the church community of Trinity United Church. If you will be living in the Cobourg area, we invite you to become active in the worship, educational and outreach ministry of the church. A faith community can be a means of enrichment for your married life together and children will also learn Chrisitan values. We hope you make this church your spiritual home, and sincerly wish God's blessing on you as you are married and throughout your life together!